The 11th APEC Women Leaders' Network Meeting closed in Ha Noi on Sept. 21, making 11 recommendations to APEC leaders, including the facilitation of women's participation in the digital economy. In a statement released at the closing ceremony, the Women Leaders' Network (WLN) says: "The WLN strongly believes that the economic contribution of women and gender-responsive policies and practices will bring about sustainable economic growth and poverty reduction in the region and will advance a stronger APEC community." 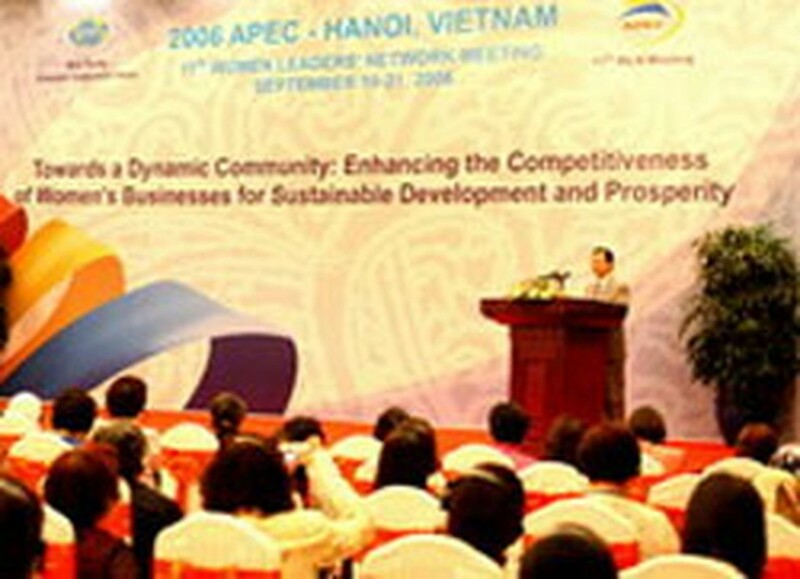 The WLN proposed that APEC ministers responsible for micro, small and medium enterprises (M/SMEs) review existing investment, business and credit laws, regulations and practices so as to eliminate gender bias; and identify, fund and implement gender-responsive programs and policy models that will assist women-owned and/or women-led M/SMEs. The WLN also proposed that APEC leaders encourage APEC enterprises to adopt and implement the International Labor Organization's Code of Practice concerning HIV/AIDS and the World of Work, so as to help women avoid HIV infection. The WLN made a commitment to establish a WLN Secretariat which will be based in the Philippines, to monitor the APEC's response to the WLN's recommendations and to develop a holistic Strategic Framework for Women's Enterprise Development to build the capacity and support the growth of women-owned and/or women-led enterprises, at all stages of their business. The Vietnamese Minister of Planning and Investment, Vo Hong Phuc, who will chair the APEC Small and Medium Enterprise Ministerial Meeting on Sept. 28-29, accepted the WLN's recommendations and promised to present these recommendations to the meeting for discussion. At the closing ceremony, Diana Abruzzi, Chairwoman of the International Women's Federation of Commerce and Industry and Vice President of APEC Confederation of the Women's Business Councils assumed the presidency of the APEC WLN for 2007. In the afternoon, the APEC WLN issued a press release calling for efforts to prevent HIV/AIDS by increasing women's economic independence.